Technology advancements have changed the way we live and function and this tech-centric shift is reflected in both good and some not so good ways in the built environment. The widespread integration of technology into building design and the advent of “smart” design can add convenience and efficiency. While the added technology has benefits, it is important that the built environment remains human-centric. Too much tech-centricity can feel like a gamer was on the interior design team. This may be a fun aspect to explore but being in such a space can have adverse impact on occupants. I recently stayed at a hotel in the silicon valley that reflected the global center of high technology, innovation and social media. Although I found the design and its various components rather fascinating, I was very aware that I was not comfortable in the space and that it felt a bit disorienting. The geometric wall behind the reception desk was fine at first glance but it was at an odd angle and the black spaces within the geometric shapes and the fact that the wall stopped just short of the high ceiling leaving a gap of blackness gave it a surreal floating quality. My room, like the hotel lobby, was decorated with bright and bold colors with few natural or real elements. The wardrobe and desk were fake veneers resembling wood but were cold and unnatural to touch. If you Google digital pixel noise, you’ll know what the artwork looked like. The closet had amber tinted glass doors displaying two robes hanging side by side and facing out. The closet was backlit with orange lighting reminding me of a Stanley Kubrick film that to this day I wish I could unsee. The room did have some fun technology for controlling the lights, window shades, tv and shower temperature but the room and other spaces in the hotel lacked calming elements. My stay at the hotel got me wondering about tech-centric design and spaces purposely designed to feel like you’ve entered a video game. Maybe “tech-centric design” makes you think of something a little more futuristic like the office shown below. 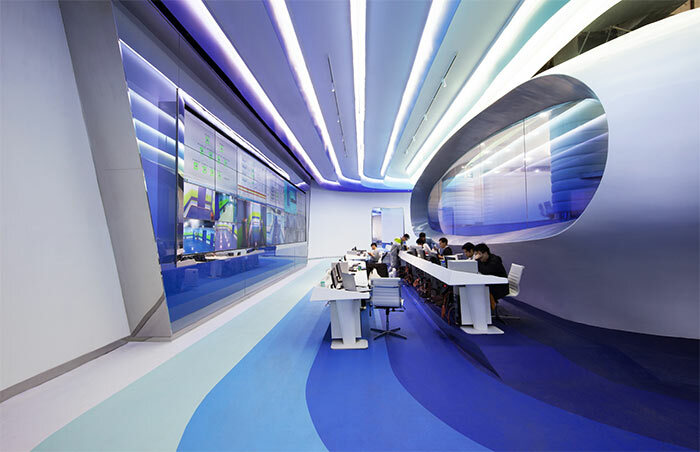 it’s the office of Chinese data center Cloud DCS, but it looks like something straight out of a science fiction movie. A large enclosed area that resembles an otherworldly spaceship sits in the middle of the area, and the design palette is comprised of plenty of white alongside cold toned blues and greens. The problem with spaces like this office and my hotel room is that they tend to feel cold and sterile. If you’ve ever been in a space like these, you know what it’s like. On the surface, you may appreciate the intent but this style of design has consequences. These spaces can feel unnatural. Largely, this is a biological response. As humans, we instinctively respond well to natural environments. 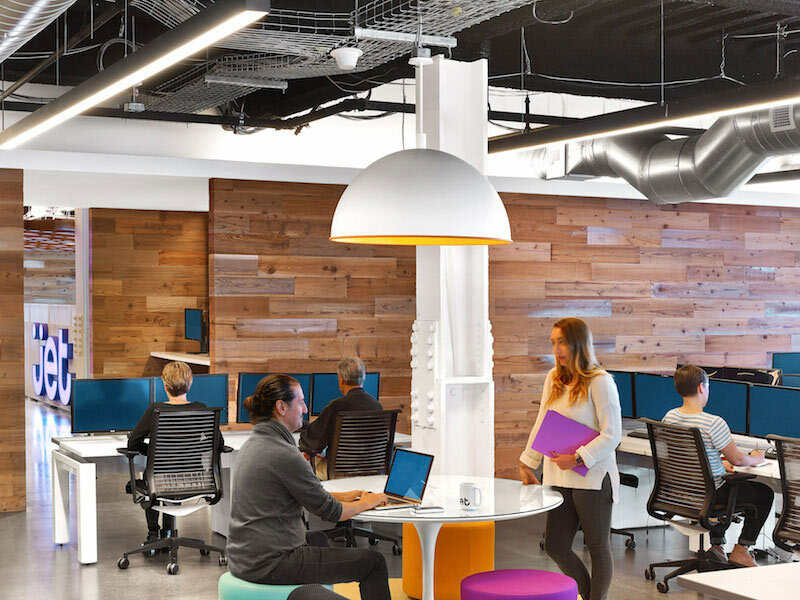 These tech-centric spaces cut off the natural environment, replacing daylight with harsh fluorescent lighting and swapping natural materials for untextured, manufactured materials. Architectural theorist Nikos Salingaros told the Clarion Review that this sterile appearance comes from “the deliberate removal of certain mathematical qualities from man-made structures, namely those qualities that characterize living and natural forms.” Here, Salingaros is talking about natural patterns like fractals that are present in nature and have historically been present in architecture. Modern design often removes these patterns, creating abstract, less engaging buildings that don’t satisfy our need for nature. Of course, technology isn’t bad, but these sterile spaces aren’t optimized for human occupants. Tech-centric design can be an interesting concept to explore, but hopefully not at the expense of cutting off humans from the natural world around them. Designers can tackle the challenge head-on using biophilia as their north star. Biophilia is the simple concept that humans feel and perform best when they’re connected to nature. Over the last several years, the effects of biophilia on mood, productivity, and health have been extensively documented, and the benefits are hard to ignore. 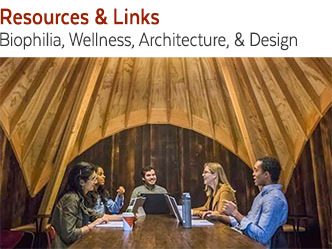 Biophilic design has been shown to increase productivity, reduce stress, lower blood pressure, and even facilitate collaboration and social interaction. Consequently, architects and designers find when they design with biophilia as their guide, the result is better built environments. In all types of spaces, from corporate offices to local restaurants, the effects of biophilic design are effective. Experts agree that biophilia is an impactful means to achieve smart commercial design. Simply put, people positively respond, mentally, physically, and socially, in biophilic environments. 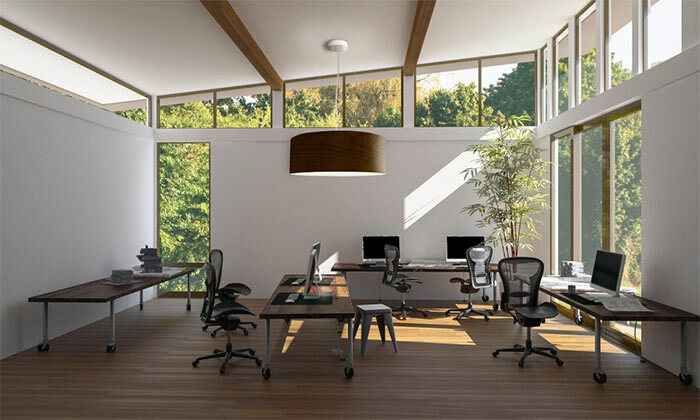 Many designers have also turned to biophilia to reinvigorate offices by adding some natural components to a sterile space. The idea here is to rethink existing tech-centric spaces and naturally incorporate biophilic elements. Instead of allowing technology to completely consume a space, designers are redesigning with biophilia in mind and anchoring the existing tech space in a more organic fashion. The UK Green Building Council’s office is an excellent example of this hybrid approach to design. 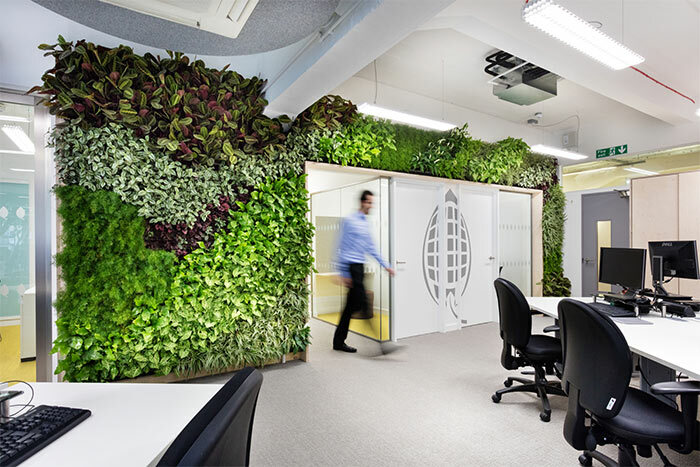 Designed by Morgan Lovell, the office’s main area boasts a beautiful living wall comprised of over 1,500 plants. In addition to the living wall, there are plenty of plants mounted around the room, and there’s ample natural light. While the space hosts a computer lab full of technology, the additional wellness features make for a more welcoming lab. Prescient’s Chicago office is an example of a space that uses wood to add an organic, warming design element. Designed by Perkins+Will, a firm that prioritizes green design, the high-tech global security firm’s office is a combination of contemporary design and biophilic components. Exposed ceilings, glass and steel are nicely paired with plenty of natural light, walnut furniture and reclaimed wood paneling to anchor the space in the natural world. The office feels contemporary and cutting edge, but it’s ultimately grounded in nature. Wood is a critical part of biophilic interior environments. Reclaimed wood, in particular, is an excellent green building material, and in many ways it contributes to better occupant wellness. Designing with organic materials like wood can easily transform an unnatural, sterile space into an oasis. Jet.com’s Hoboken office is another example of how biophilic design can mesh perfectly with technology. Reclaimed Lost Coast Redwood paneling adds an organic touch with its worn, weathered barn wood character. The wood nicely complements the vibrant colors of the furnishings, but most importantly, it places nature at the heart of the space. Technology will become more and more essential in the built environment but it should be integrated so it enhances the built environment. Spaces need to be designed such that they are humanistic at the core, and that means designing with a focus on wellness and nature. Humans are living beings. Being in the presence of plant life and weathered landscapes resonate and cognitively stimulate, thus reflecting those aspects in the built environment make sense to enhance building occupant productivity and well-being.